The newest game in Wager Gaming's Wild X series of 3-reel slot games has just arrived at Liberty Slots! Like other Wild X games, Ultimate 10X Wild has “Must Win” jackpot feature that guarantees the game's progressive jackpot is won before it reaches $25,000. To welcome the new game, Liberty Slots is doubling its welcome bonus until the end of August. New players will receive a 200% bonus on their first deposit. (Coupon code 200LS). 7x Lucky Sevens was the last WILD X slot game to debut at Liberty Slots. The feature packed three-reel slot games are designed for a mobile gaming environment but are also available in the online casino for desktop and laptop players. 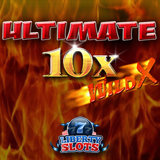 Ultimate 10x Wild has two Wild symbols that multiply wins up to 100X the triggering bet! Liberty Slots welcomes new game by doubling its new player Welcome Bonus until August 31, 2017. “With ten winning combinations and an estimated RTP of more than 96%, this game is destined to provide some significant pay days for some lucky players!” said Liberty Slots manager Mark Ramirez. As in 7x Lucky Sevens, Ultimate 10X Wild also has a ‘Must Win’ progressive jackpot that is guaranteed to pay-out by the time it reaches $25,000. The jackpot can be triggered at any time by any coin value combination although playing more coins (maximum three) increases chances of winning the jackpot. The Must Win feature has surprised some players with massive payouts when they least expect it. Last month Kim D of Pennsylvania was playing 7X Lucky Sevens, placing small bets, when suddenly the game was forced to pay out and she won $19,429.51 on a single spin. Players from all over the world enjoy Liberty Slots Casino’s huge selection of casino games from Wager Gaming that aren't found at many other online casinos.